Note the critter in upper petal. "Many tired warriors are like this rose, dying to self, not getting enough life support from the rest of the body ( people growing more selfish & self protective). The roses looked dying, had lost their luster, but they are still my roses, though they no longer feel a part of anything. The death to self has been painful, but with one touch, they will be washed, relieved of torments, and revived in luster and appearance to glow like the Son." Roses attract. Everyone wants to smell their fragrance. But if dying and worn, they have not that same drawing. 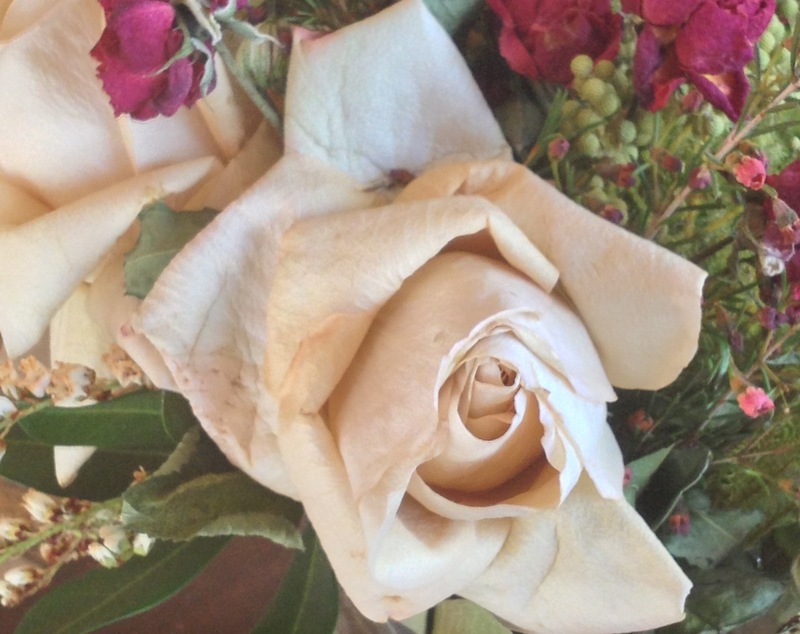 There was a bug on the old white faded rose. Bugs feed on dead things. The Church can't do things always “the old way.” We need to be very dependent on His instructions day to day, moment to moment.
" I want a vibrant church and sons and daughters who smell like ME. I want them to reflect My glory, My love, My compassion, My power, My Joy, My peace, My humility, My patience & forebearance and all that I am. I am not a God afar off, but CLOSE AT HAND. My glory has been touching you in small doses, allowing you to see the depths of depravity in your own heart. Shining into the caverns of unbelief, to illuminate your understanding so that you repent and grow in grace and glory. But as My river of honey flows out like a tsunami, I will destroy every bit of unbelief, doubt and skepticism in your hearts. I will destroy every lie of the enemy, every stronghold, every chain that has bound you. Love is truly the GREATEST gift that I have given to mankind. I AM LOVE, so all you have to do is ask for more of ME. Ask for more love, and I will give to you, that you can love with MY LOVE. My supernatural LOVE, is more powerful than anything the enemy can use. My LOVE leads to repentance. It is the most powerful force in heaven and on earth. Contend for My love. Ask for it daily. Ask for it to fill you up and to help you love others as I LOVE THEM. I will give you the grace to love if you do. For you are called to LOVE your enemies. You are called to LOVE instead of Hate. YOU are called to love them, even as I have loved YOU, and been patient with your weaknesses and foibles. So will you ask now to love as I love ? Will you lay down all your worldly vendettas ? For vengeance is MINE says the Lord is written clearly for all to see.